At Hands Cleaners, we can offer School cleaning Leicester as well as College and University Cleaning across Leicestershire. Our customers include Universities, Academies, Secondary and Primary Schools as well as Nurseries and Play Groups. Here at Hands Cleaners utilise our wealth of experience of providing effective cleaning services that are just right for the educational environment. We have DBS Checked School Cleaners to work in every education environment from nurseries to universities, and trained to provide a variety of school cleaning services in educational areas making sure all services are carried out to a high standard. It is highly important for an educational area to be cleaned thoroughly; many children come and go in different classrooms leaving various rubbish and germs around. If germs are circulating, it won’t be soon before long people get ill and catch colds easily which is why meticulously cleaning each classroom and every part of a school, nursery or university is very important. We provide an excellent service and make sure you get value for money. Here at Hands Cleaners, we understand the special needs of complete school cleaning services in an educational establishment. We can offer daily cleaning including after break times and lunchtimes, and we can clean at times that suit the school hours, taking into consideration after school clubs. We carefully survey premises to make sure we can provide a bespoke specification, there are no cutting corners! Our service can also include non-term time deep cleans and floor maintenance and window cleaning programmes if you require. At Hands Cleaners, we offer daily school cleaning Leicester across all educational areas including classrooms, dining areas and kitchens, sports halls and changing rooms, toilets and play areas. We make sure you pay only for what you need whether that is vacuuming, mopping, dusting or full sanitation, maybe you need all of these services, we can provide it with all in one bespoke package. 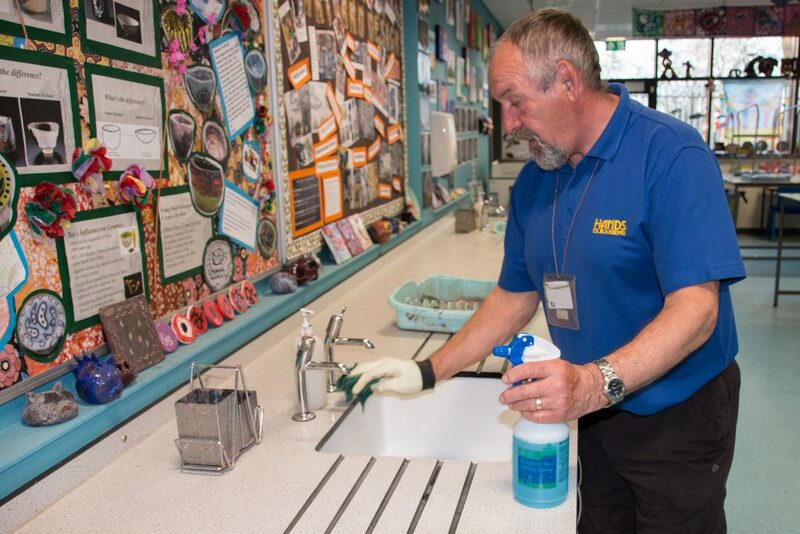 At Hands Cleaners, our flexibility allows us to we offer deep cleans within schools during school holidays and half-terms providing you with floor maintenance, window cleaning, keyboard, monitor and telephone sanitising, steam cleaning in the toilets and kitchens, steam cleaning of toys and sports equipment, carpet cleaning. Graffiti is a common problem among many schools, and we are happy to help out if you need any graffiti removal services, even at short notice. At Hands Group our staff of school cleaners are expertly trained and are carefully selected for each client job. We can also provide references from similar establishments if required. For a free assessment contact us today! Check out our cleaning guarantee or contact us on 01509 501 110 to get more information or a free quotation we are more than happy to help. Not only do we offer school cleaning Leicester, but we also offer school cleaning in Derby and Nottingham. Considering how vital schools are to the community, we understand that we have taken a huge role and we are prepared to accomplish it with exceptional results. To ensure that your school among others are always clean and on schedule, we have employed the use of computer scheduling. We will always have a team for you ready to get to work as of when we have agreed. The team will be fully aware of the areas that they will be cleaning and what is required of them. We have over 40 years of school cleaning and we always invest in the best materials for the job. We are able to carry out cleaning in labs, classes and across the school faculties. With our help, you can mitigate risks and make the school a safer environment for the children to come and learn. We have the training, the tools and the passion to keep doing what we love. We offer free consultancy and advice to our clients to ensure that they know how best they can use our services to make their schools better and cleaner. With our advice, you will be better equipped to make decisions on how you can use our services within your budget to make your school cleaner and more hygienic. We offer you competitive rates, comprehensive service and the best value for your money. We ensure that you see the value in using our services and the difference that comes with hiring us. We do this not only for business but to also make sure that our children have the cleanest and safest surrounding to learn in. If you would like more information get in touch with us today. We provide a wide variety of cleaning services including carpet cleaning and window cleaning.